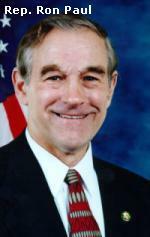 by Congressman Ron Paul, before the US House of Representatives on February 16, 2006. [HollywoodInvestigator.com] Mr. Speaker, I rise in strong opposition to this very dangerous legislation. My colleagues would do well to understand that this legislation is leading us toward war against Iran. Those reading this bill may find themselves feeling a sense of déjà vu. In many cases one can just substitute "Iraq" for "Iran" in this bill and we could be back in the pre-2003 run up to war with Iraq. And the logic of this current push for war is much the same as was the logic used in the argument for war on Iraq. As earlier with Iraq, this resolution demands that Iran perform the impossible task of proving a negative -- in this case that Iran does not have plans to build a nuclear weapon. There are a few things we need to remember when thinking about Iran and this legislation. First, Iran has never been ruled in violation of its international nuclear non-proliferation obligations. Second, Iran concluded a Safeguards Agreement more than 30 years ago that provides for the verification of Iran's fulfillment of its obligation to not divert nuclear energy programs to nuclear weapons development. Since this agreement was reached, the International Atomic Energy Agency has never found any indication that Iran has diverted or attempted to divert source or special nuclear materials from a peaceful purpose to a military purpose. But, this does not stop those eager for conflict with Iran from stating otherwise. As the Washington Post reported last year, "U.S. officials, eager to move the Iran issue to the U.N. Security Council – which has the authority to impose sanctions – have begun a new round of briefings for allies designed to convince them that Iran's real intention is to use its energy program as a cover for bomb building. The briefings will focus on the White House's belief that a country with as much oil as Iran would not need an energy program on the scale it is planning, according to two officials." This reminds us of the quick move to justify the invasion of Iraq by citing Iraq's "intentions" when actual weapons of mass destruction could not be found. The resolution's second resolved clause is a real misrepresentation of the Iran/ EU3 talks. The "efforts of France, Germany, and the United Kingdom" were not "to seek ... suspension of enrichment and reprocessing related activities..." As the EU3- Iran Paris Agreement makes very clear, the suspension of enrichment is a purely voluntary measure taken by Iran and is "not a legal obligation." This is similar to the situation with Iran's voluntarily observation of the Additional Protocols (allowing unannounced inspections) without legally being bound to do so. Suspending voluntary observance of the Additional Protocols is not a violation of the NPT. But, those seeking to push us toward war with Iran are purposely trying to connect the two – to confuse voluntary "confidence building" measures taken by Iran with the legally-binding Treaty itself. Resolved clause four of this legislation is the most inflammatory and objectionable part of the legislation. It lowers the bar to initiating war on Iran. This clause anticipates that the US may not be successful in getting the Security Council to pass a Resolution because of the potential of a Russian or Chinese veto, so it "calls upon" Russia and China to "take action" in response to "any report" of "Iran's noncompliance. That is right: any report. Mr. Speaker, this resolution is a drumbeat for war with Iran. Its logic is faulty, its premises are flawed, and its conclusions are dangerous. I urge my colleagues to stop for a moment and ponder the wisdom of starting yet another war in the Middle East.